This estimator suggests that heritability increases from 0.37 to 0.58 in men as we move from single-year income to a 20-year average. The corresponding figures for women are 0.28 and 0.46. These findings suggest that permanent income is more heritable than single-year income. This conclusion partly seems to reflect the fact that measurement error and transitory shocks generate a downward bias in estimates of heritability (Solon 1992, Zimmerman 1992, Mazumder 2005), consistent with our earlier conjecture that the heritability estimates of many other economic outcomes are downward biased. Using 15 years of data on Finnish twins, we find that 24% (54%) of the variance of women’s (men’s) lifetime income is due to genetic factors and that the contribution of the shared environment is negligible. We link these figures to policy by showing that controlling for education reduces the variance share of genetics by 5-8 percentage points; by demonstrating that income uncertainty has a genetic component half the size of its variance share in lifetime income; and by exploring how the genetic heritability of lifetime income is related to the macroeconomic environment, as measured by GDP growth and the Gini-coefficient of income inequality. - Financial behaviors are genetically influenced especially at the extremes of SES. - Personality and cognition are linked to financial distress genetically. - Within-family factors also link personality and cognition to financial distress. - Neuroticism is a more important predictor of financial distress at low SES. - Cognitive ability is a more important predictor of financial distress at high SES. This paper studies a natural experiment: the end of the “professor’s privilege” in Norway, where university researchers previously enjoyed full rights to their innovations. Upon the reform, Norway moved toward the typical U.S. model, where the university holds majority rights. Using comprehensive data on Norwegian workers, firms, and patents, we find a 50% decline in both entrepreneurship and patenting rates by university researchers after the reform. Quality measures for university start-ups and patents also decline. Do bureaucrats matter? This paper studies high ranking bureaucrats in India to examine what determines their effectiveness and whether effectiveness affects state-level outcomes. Combining rich administrative data from the Indian Administrative Service (IAS) with a unique stakeholder survey on the effectiveness of IAS officers, we (i) document correlates of individual bureaucrat effectiveness, (ii) identify the extent to which rigid seniority-based promotion and exit rules affect effectiveness, and (iii) quantify the impact of this rigidity on state-level performance. Our empirical strategy exploits variation in cohort sizes and age at entry induced by the rule-based assignment of IAS officers across states as a source of differential promotion incentives. 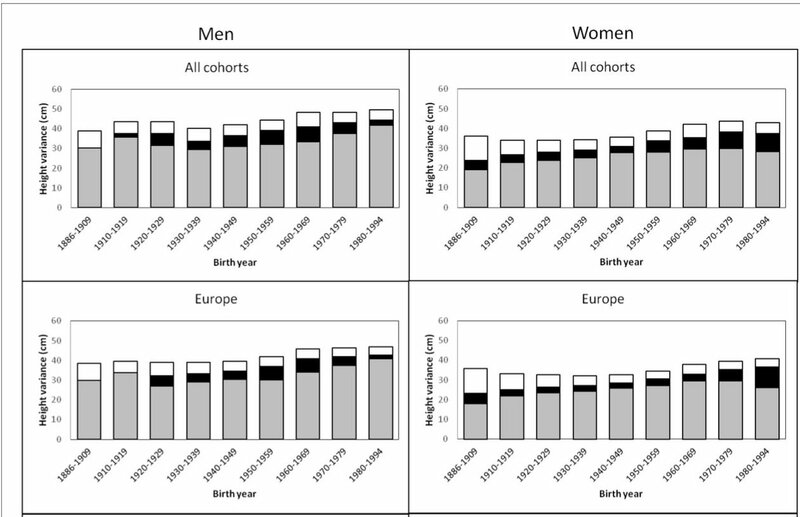 Although genetic variance showed a generally increasing trend across the birth-year cohorts, heritability estimates (0.69-0.84 in men and 0.53-0.78 in women) did not present any clear pattern of secular changes. Comparing geographic-cultural regions (Europe, North America and Australia, and East Asia), total height variance was greatest in North America and Australia and lowest in East Asia, but no clear pattern in the heritability estimates across the birth-year cohorts emerged. _Our findings do not support the hypothesis that heritability of height is lower in populations with low living standards than in affluent populations, nor that heritability of height will increase within a population as living standards improve_ [!!]. We find change in personality over a ten-year period does not predict change in political attitudes, which does not support a causal relationship between personality traits and political attitudes as is frequently assumed. Rather, political attitudes are often more stable than the key personality traits assumed to be predicting them. Finally, the results from our genetic models find that no additional variance is accounted for by the causal pathway from personality traits to political attitudes. Our findings remain consistent with the original construction of the five-factor model of personality and developmental theories on attitude formation, but challenge recent work in this area. Using accounting data spanning the 20th century, we show that most accounting-based return anomalies are spurious. When we take anomalies out-of-sample by moving either backwards or forwards in time, their average returns decrease and volatilities increase. These patterns emerge because data-snooping works through t-values, and an anomaly’s t-value is high if its average return is high or volatility low. The average anomaly’s in-sample Sharpe ratio is biased upwards by a factor of three. The data-snooping problem is so severe that we would expect to reject even the true asset pricing model when tested using in-sample data. Our results suggest that asset pricing models should be tested using out-of-sample data or, if not not feasible, that the correct standard by which to judge a model is its ability to explain half of the in-sample alpha. Whether or not the average heritability of the sample is attributed to a main effect, or included in the moderated effect (as it was here) is a statistical artifact of how SES is scaled: So the main effect of genes on IQ was zero but that doesn't mean the average h2 was zero, as can be seen: it's not. "The results also don't fly in the face of prior reports. In classic twin models (reported in the paper) we get the same (very high) heritabilities as have been reported by Bouchard and others in other samples. But you are right, there is a theoretical claim: it's about the mechanism by which many genes affect IQ. It is that "low IQ" alleles and "high IQ alleles" differ in how much information they extract from the environment and incorporate into the internal representations of the world which we manipulate when we reason. So the alleles can't generate much variance between people in informationally impoverished environments (where there is little complexity to extract), but can generate large differences in attained IQ in environments with high information availability. I think this fits well with the finding that bright children have delayed cortical pruning and prolonged sensitivity to the environment (as reflected in a later loss of shared environmental effects among initially brighter children. Not sure that we're as much in disagreement as you might imagine." Psychological comments: Does social class affect intelligence only in America? 1. Use of children in samples. IQ is still "affected" by shared environment in children. 2. Racial differences in the U.S. There are much more people in the far low end in the States. 3. Less variance on the low end (less opportunity for genes to show). 4. "Double counting": SES is not exogenous, so it's technically not kosher to do these types of studies. - JayMan had some objections (on James Thompson's blog), w/ the strongest-looking one being that SES is not a good metric compared to income because of confounding, but I'm not sure whether that makes sense. And the cross-country differences seem like a strong rejoinder.